1970 Brought a Sweet Start for Nomie, Bill and Blair! It was a year of bell bottoms, The Beatles breaking up, and Janis Joplin and Jimi Hendrix breaking on through to the other side while Joni Mitchell watched from the screen door as a big yellow taxi pulled away. Looking back at 1970, much of what has shaped our culture, our music, and our collective consciousness was going on swiftly and simultaneously. But as with any year, month, or even day, as monumental moments for our country and world were occurring, so were the more personal moments that make up what truly amounts to who we are, who we meet along the way, and the lives we live every day. And at Blair Candy, while we mourned the loss of Jimi and Janis and made promises to ourselves that we wouldn’t let them pave paradise and put up a parking lot, it was meeting Nomie and Bill that has made the bigger difference in our lives. And we’re happy that they have been as glad to be with Blair as we have been glad to count them among our family. So who are Nomie and Bill, you may be asking? Two Reese’s Peanut Butter Cup loving members of the Blair Candy team. Two teammates that bring their best game to the field every day. Two teammates that have been have been playing Varsity for…40 years! The day after Nomie Gensamer graduated from high school in 1970 she began her position as Blair Candy’s bookkeeper. And 40 years later, we have some of the best kept books in the business! Needless to say, in that amount of time we’ve called on Nomie for a few other tasks as well, essentially everything but unloading trucks. And for that, we turn to Bill Yoder, who has worked with Blair for 40 years as well. What can we say? We have a pretty awesome place here. Come over to the Blair side…we have candy! We get to work with Bill and Nomie every day, but chances are you haven’t met them before. So we asked them to share some sweet memories with us so we could share them with all of you. 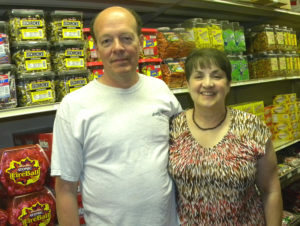 We’d love to hear how your own candy past compares to Bill’s and Nomie’s! While you might think it’s been all goody gumdrops that has kept Bill with Blair for so long, that’s not exactly the truth. In fact, Bill had a very rough start with us, dropping a box of Wrigley’s during his second day on the job, which bounced back hitting him in the face. Many would have likely walked away forever, not letting the warehouse door hit them on their way out! But Bill went to the hospital, received some stitches, and came right back to work. I’m not going to lie – I would have spent the rest of the day on the couch feeling sorry for myself. But it’s precisely this dedication from Bill that we have come to know, respect and appreciate through the years. Nomie remembers a time when the phone never rang with questions of calories or peanut allergies. A time when the candy manufacturers sent samples for employees to try, something that no longer happens. A time when there was no such thing as Nostalgic Candy, for it was all just beginning with just a few handfuls of treats to choose from compared to the abundance of options today. And while digging through this candy bag of memories, Nomie mentions something that has not only helped our business grow, but also helped make each day a little tastier for everyone – candy has become a staple. What was once a luxury is now enjoyed by anyone who wishes to satisfy their sweet tooth, and that is a very good thing! Thanks Bill and Nomie for the trip down memory lane. And thanks for all the hard work and heart you’ve invested in Blair Candy. We’re proud that this year marks Blair Candy turning 71, and that we’ve had the pleasure of working with you for 40 of those 71 years. We wouldn’t be who we are without you! A lot of people find themselves coming back to Blair time and again for our Nostalgic Candy – tempting retro treats we enjoyed years ago that are as packed with memories as they are with deliciousness. However, while even I highly doubt anything will ever roll off the candy line that replaces my sweet tooth’s Number 1 craving – Satellite Wafers – there are tons of terrific new candies coming out every year that are innovative, flavorful, and downright fun! Let’s take a closer look at what this year in candy has to offer…so far! Push Pop SliderZ – Push Pop is by no means a new name in the candy game, but they aren’t resting on their lollipop laurels. 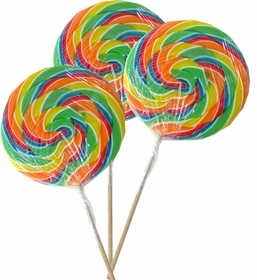 The new SliderZ lollipops are similar to classic Push Pops, but are a bit sleeker and more modern looking than their predecessor. The original lollis are still available, and still a delicious and popular candy that has kept its look fun and fresh over the years. But this new package not only adds an extra element of fun to the experience with a flip, but also adds a techy look to the tasty treat. Just keepin’ up with the times! 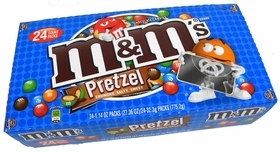 M&M’s Pretzel – Add these to the “I don’t even have to try these to know they’re delicious.” list! Anyone who has ever enjoyed the simple but perfect combination of chocolate and pretzel knows why this is an amazing idea. M&M’s have near universal appeal – I don’t think I’ve ever met anyone who doesn’t consider them a favorite. But just like Push Pop didn’t let its status as a fan favorite keep them from creating a new treat, M&M’s impressive family of tiny melt-in-your-mouth candies seemingly never stops growing. I lean toward the plain and the peanut butter, but am excited to add pretzel to the mix! If you’re more of a coconut fan than a pretzel fan, M&M’s Coconut may be what you’re looking for. By the time I’m done writing this post, who knows what they’ll have come up with? Icee Squeeze Candy – I love Icees. Like…love them love them. They’re cheap, easy to find, refreshing, color your tongue, and taste awesome – what’s not to love? However, there are times that an Icee is not an option, like when you’re sitting at your desk at 3pm and your nearest opportunity to give yourself some serious brain freeze is 2 hours away. And for those times, there is Icee Squeeze Candy. You can even keep it in the fridge! Just don’t blame us when your coworkers forget it’s not theirs, OK? And that’s just a handful of the fun! Check out our full selection of New Candy For 2010 and let us know which ones you think make the grade. Candy As Décor? Get Deliciously Creative! There are many things we do and items we include when working to make our homes a reflection of our personality and style. However, no matter how much we love the little knickknacks we purchase and colors we choose, more often than not we’re looking for something new and fresh a few months later. With the countless home remodeling and decorating shows that are splashed across just as many television networks, it’s no mystery why we find ourselves wanting to try all the different painting techniques and fabric choices the world has to offer. However, most of us can’t afford to do a complete overhaul on every room in our home whenever the mood strikes. Unless, of course, we’re slowly eating away at it…literally. Don’t worry, we aren’t suggesting you make a snack of your sofa! For the larger pieces of décor in your home, such as paintings, electronics and furniture, it is still best practice for your time, money and the planet to invest in pieces you’re confident will suit your needs for many years. However, for the smaller accessories – the ones that really shape the overall feel of a room – consider something a bit sweeter. Consider Candy! Let’s look at a few ways to build candy into your design, no matter what satisfies your sweet tooth! Bowls as decoration are common in almost any home you enter. However, what’s inside those bowls can vary quite a bit, from simple glass marbles to potpourri. Simple glass marbles that you soon grow tired of looking at, and potpourri that quickly gathers dust, that is. You know what I’ve never grown tired of looking at, and has never grown dust in my home? Candy! To be fair, putting out a bowl of candy isn’t the newest idea on the block. But to choose candy that complements your home is something most of us have never done. Consider the other colors in the room and the overall look you’d like to achieve. Want several bowls of different colors to bring lots of brightness? Tootsie Frooties are a fun and flavorful way to achieve a rainbow of colors. And in addition to being available in a ton of tasty varieties, they’re also individually wrapped, making them perfect for candy bowls many people will be sampling from. Candy can also be used for sharp color impact in more modern design. Have a minimally-decorated white and black or gray and yellow room, for example? Consider adding several clear bowls full of deep red Atomic Fire Balls! You’ll get the cool, contemporary feel of an artistic space, and a sweet and spicy pick-me-up whenever your candy cravings kick in. Peppermints For Your Palomino? “Go Right To The Source And Ask The Horse”! At Blair Candy, nothing makes our day more than hearing from our happy customers. However, for all the people we have had the pleasure of meeting over the years, we were always missing something – the candy-loving horse market! To be fair, we didn’t even know this demographic existed until we heard from Susie Stephens, one of our Tennessee regulars who has been known to place an order or two (or three…or four!) for our Red Bird Peppermint Sticks. As far as we knew, Susie had the freshest breath in the south! 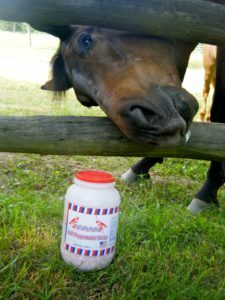 These oversized canisters of peppermints pack a minty punch with 240 sticks per container, and Susie is among their biggest fans. Well…we thought she was, anyway. As it turns out, she’s actually buying them for her horse. Yep, you read it right! 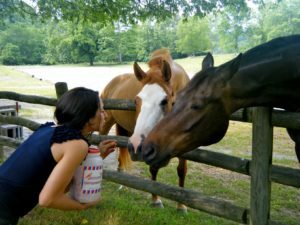 These soft, melt-in-your-mouth treats are actually a favorite of Susie’s six year old Oldenburg Warmblood horse, Rohan. And he’s chomping at the bit to get to them. Literally! Susie and Rohan are award-winning partners is a discipline known as Dressage. Susie explains Dressage as “dancing or ballet on horseback”. It is a difficult but beautiful sport appreciated for the athletic and graceful skills of both horse and rider. Anyone who has had the pleasure of training or simply riding a horse knows the importance of having a trust and connection with your horse. An emotionally-intelligent animal, horses, much like humans, can be headstrong and require that you ‘prove yourself’ before you earn their trust and affection. Susie uses the Red Bird Peppermint Sticks to help strengthen her bond with Rohan while treating him to refreshing candy that helps him to accept and chew the bit. Rohan receives 2 peppermints prior to training, and 2 more when Susie has finished riding. As rewarding as training is, it is also a challenging endeavor, and the peppermint candies help Susie to attract and keep Rohan’s attention while also ensuring that the proper bit connection has been made. You’ll notice in the photo below, however, that Susie has to keep the container out of sight to keep it out of Rohan’s mind. His training can get a little off track if he spies the familiar canister! Susie and her daughter Stefani Gianni, a Los Angeles-based actress, consider Rohan and his ‘horse brother’ part of the family, along with their ‘little brother’ Izzy, a beautiful Boxer who can’t seem to keep his paws off their peppermints, either. Susie did her homework to ensure that the peppermints were safe for the 4-legged members of her family before introducing them. And of course, just to be super sure, she also tested them on humans. Namely, herself and her daughter! What offbeat ways do you have for making the most of candy? We’d love to hear from more people about where our candy is making an appearance!